While progress has been made towards pay parity between the sexes, the Institute for Women's Policy Research estimates that it will not be reached until 2059. 54 years after the the United States passed the Equal Pay Act, women in the US still face a substantial gender wage gap across the spectrum. Today, on average, a woman earns 79 cents for every dollar a man earns, and women’s median annual earnings are $10,800 less than men’s, according to a report released by the Senate Joint Economic Committee Democratic Staff last April. 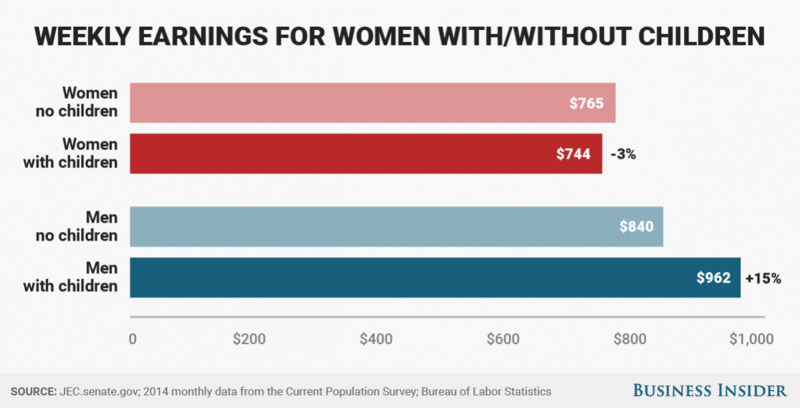 The five charts below illustrate the significant pay discrepancies between men and women based on education, race, age, geographical location, and more. According to data taken from the US Census Bureau, the average gender pay gap in the United States is around 21%, meaning that, on average, a woman earns 21% less than her male counterpart. That gap can be larger or smaller depending on the state someone lives in. 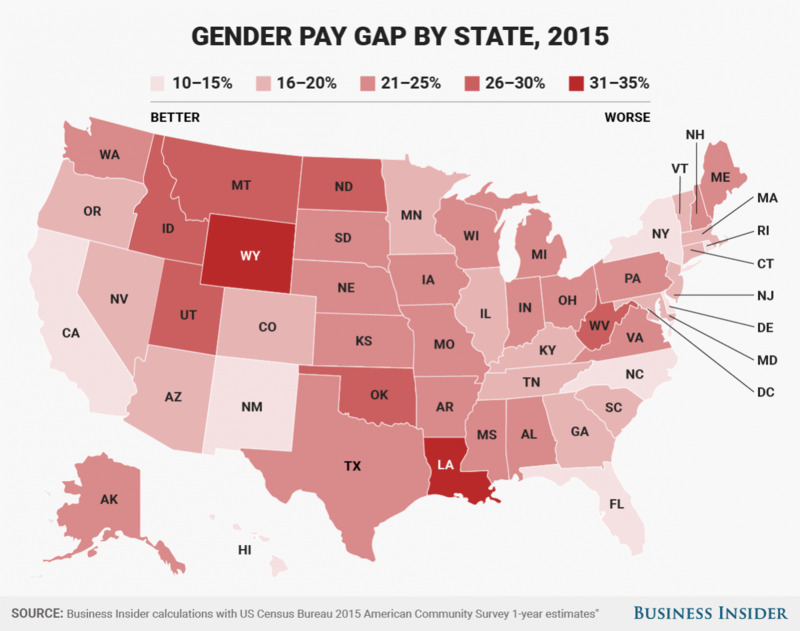 In Louisiana, for instance, the gender pay gap is 34.7%, the biggest wage gap in the nation. 21 states in the country currently have gender pay gaps that are larger than the national average. Most states have implemented laws against gender discrimination, and all but three have laws prohibiting employers from discriminating on the basis of gender, the report says. Washington, D.C. has the smallest pay gap at 10.4%, which means that women earn an average of 10.4% less than men in the area. Black and Hispanic women are most affected by the wage gap, especially when compared to white men, who make up the largest demographic segment of the workforce, according to the Senate report. Asian women face the smallest wage gap – they earn 84% of what white men earn, resulting in a pay gap of 16%. White women earn 75% of what white men do, while black women earn 65% and Hispanic women earn 55%. The Senate report noted that women of color face a far smaller pay gap when compared to men of color. Black women earn 82% of what black men do, and Hispanic women make 88% of what Hispanic men do. 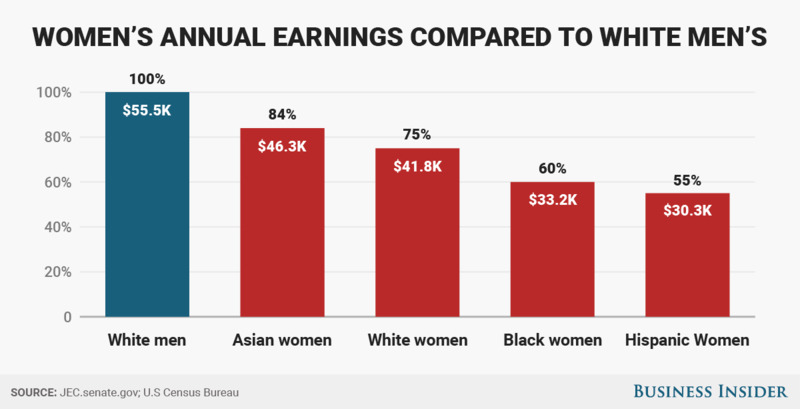 The larger disparity between white men's and women of color's earnings could be attributed to the fact that "women of color suffer both because of their gender and their race," the report says. The only income source through which women age 65 and up make nearly the same as what men over 65 make is Social Security. In 2014, women over 65 made about $277 million, while men over 65 made about $286 million, according to the report. However, since Social Security only accounts for a certain percentage of the aggregate income that people over 65 receive, women still continue to lag behind men when aggregate income is accounted for. In total, women over the age of 65 collectively earned $641 million, while men over 65 earned $965 million. That means women earned 66% of what men made. 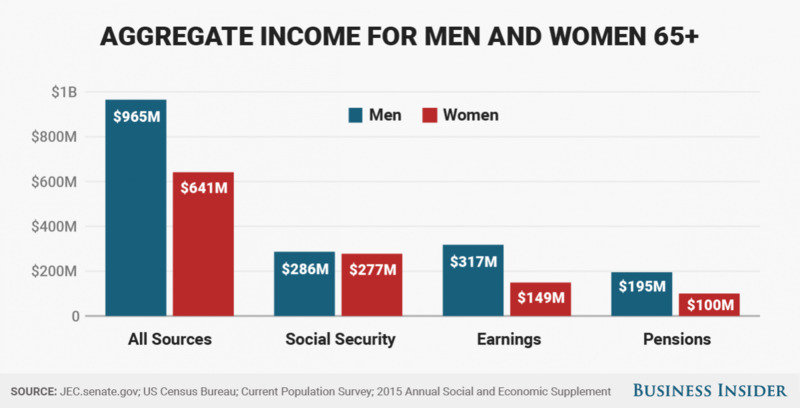 When accounting for only earnings and excluding income accrued through Social Security and pensions, women over 65 made just 47% of what their male counterparts did. "Data suggest that women suffer a 'mommy penalty' after they have children, earning 3 percent less than women who do not have children. The opposite is true for fathers, who earn on average 15 percent more than men without children," the report says. During the 2012-2013 school year, women earned 57% of bachelor’s degrees, 60% of master’s degrees and 51% of doctorate degrees. Despite being better-educated than men, women with professional and graduate degrees still earn less than their male counterparts, and sometimes even less than men who are less educated than they are. The report says that this discrepancy can be attributed to the fact that women tend to pursue fields that pay less than fields pursued by men. 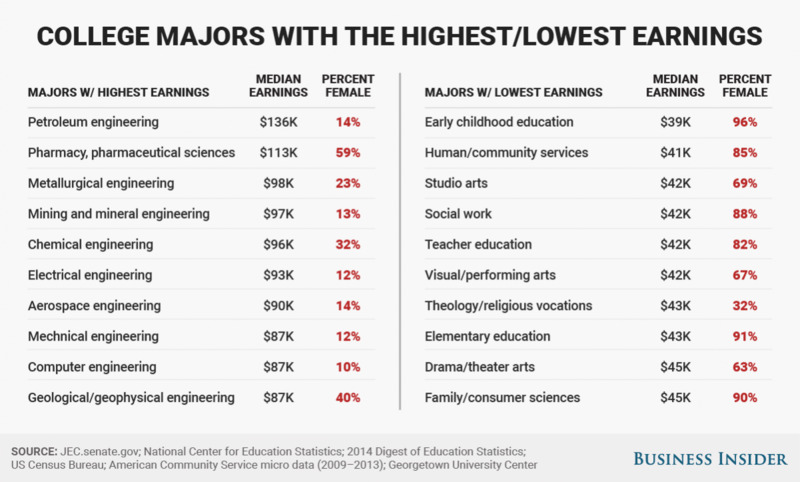 College majors that have high reported median earnings, like those in the STEM fields, consist of far more men than women, based on data taken from the National Center for Education Statistics and the US Census Bureau. By contrast, jobs in fields like education, social work, and nursing are largely female-dominated and pay substantially less than fields that are male-dominated. "Women earn more than 60 percent of degrees in nine of the 10 lowest-paying fields of study, but less than 30 percent of degrees in seven of the 10 highest-paying fields," the report says.